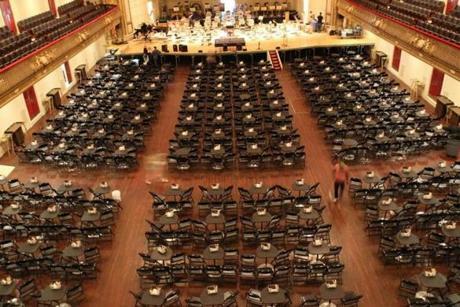 Each year in early May, Symphony Hall is transformed overnight from Boston Symphony Orchestra concert venue to cafe-style seating for the Boston Pops. 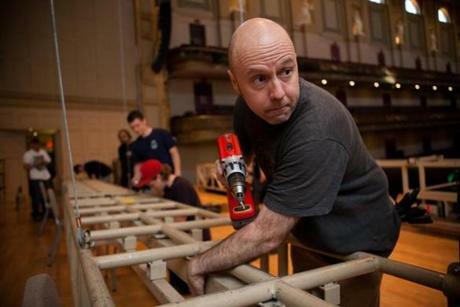 Pictured, John Moorin (right) worked on the lighting assembly as part of the conversion. 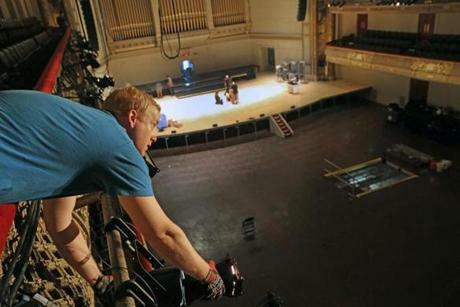 Seating capacity drops 10 percent, from 2,625 to 2,365, as tables and chairs replace the fixed leather seats. 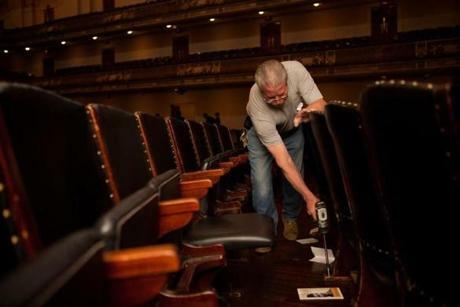 Pictured, Tom Davenport removed bolts from the base of the BSO leather-style seats. For the 2013 Pops season, special lighting and sound systems have also been installed, along with a large movie screen to accommodate this year’s celebration of music from Hollywood films. Pictured, the crew installed the lighting. 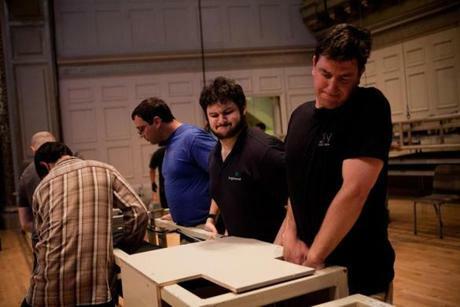 This year’s makeover began Sunday afternoon, following a Handel and Haydn Society concert. By 7 p.m., it had kicked into high gear. 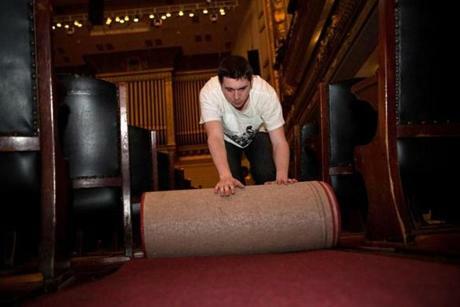 Pictured, Dillon Doherty rolled up a aisle carpet on Sunday night. The transformation utilizes the design feature of a built-in elevator as old as the 113-year-old hall itself, yet it remains hidden from public view. 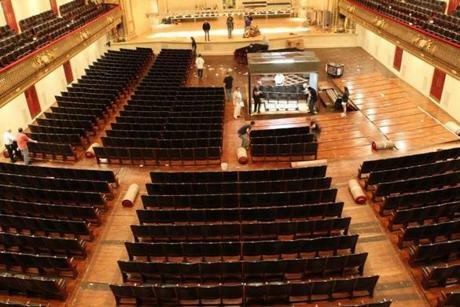 Symphony Hall was designed by architects McKim, Mead and White and commissioned by BSO founder Henry Lee Higginson. Lee Mulder adjusted the lighting for the Pops opening. 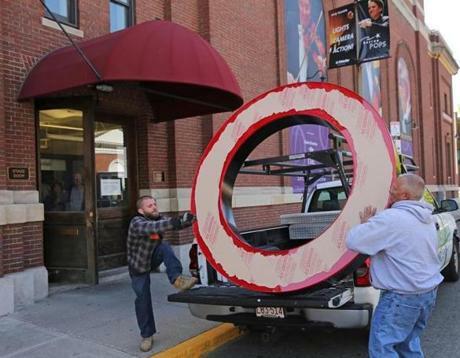 From left, Tim Goguen and Scott Angus lifted the "O" of the new Pops sign off a truck. 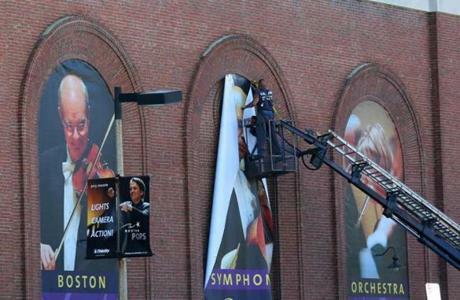 Workers tore down the old signs at Symphony hall. Dan Theroux worked on the sign while down below Scott Angus helped. 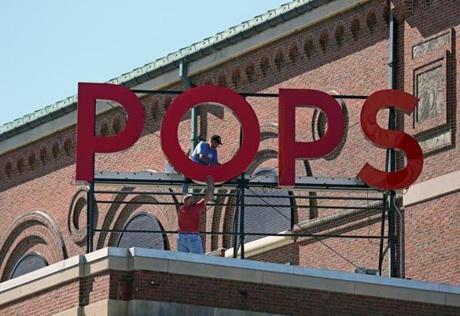 The Boston Pops sign indicates the start of a new season. 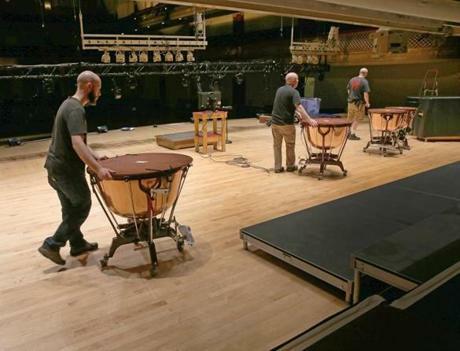 The complete transformation of the Symphony Hall from BSO to the Pops, just in time for Wednesday's opening night.